The expansion of feral hog (Sus scrofa)populations in the United States has resulted in increased efforts to develop and implement control strategies designed to minimize the impacts done by this invasive species. 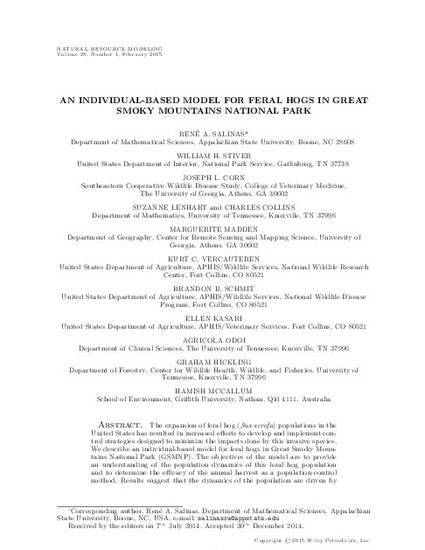 We describe an individual-based model for feral hogs in Great Smoky Moun- tains National Park (GSMNP). The objectives of the model are to provide an understanding of the population dynamics of this feral hog population and to determine the efficacy of the annual harvest as a population control method. Results suggest that the dynamics of the population are driven by fall hard mast production and the GSMNP harvests currently limit growth of the population, but these control efforts have not reduced the population.